If there are pictures of the tournament on your website, please email me (webmaster) the URL to put a link here. Our tournament went fine, we really had a good time! Two dutch teams made first and second place, Ljubljana from Slovenia made the third, and we are very happy with our 6. place! only one week left to the first UWH tournament in Munich! We could get an extension of the time in the pool, so that the games can be prolongated. The schedule and the lenght of the games will be announced at the captains meeting at 9:30h in front of the pool (outside). There you will get the entrance cards for your team to the pool. Please bring the registration fee of 50 Euro per team and the entrance fee for the party 12 Euro per person, including food and drinks, to the captains meeting. Games will start at 10:15h. All teams (exept Velenje and Serrasalmus) will arrive Friday night. You can find the plan to the sports hall in one of the attachments. Because there are so many people sleeping in the sports hall, it wont be possible to organize a breakfast on Saturday and Sunday morning. So NO breakfast, sorry! Sunday you can easily take the metro to the city center and look for a nice café or a place where you can taste "weißwürste" with beer... (they are really that crazy the bavarians, they drink beer in the morning!) But for saturday morning you have to bring your own coffee/tea, bread and nutella! Not to far from the sleeping place there is a supermarket, but it's maybe more easy to bring everything that you need with you. For your arrival friday night: we will expect you after 22:00h in the sports hall. Please arrange you departure so that you can be in Munich before 24:00h, so everybody can sleep well, and is not disturbed by arriving teams! Bring your sleeping bags, camping mats and some lamps with you! If you get lost in Munich you can call us: +49 176 24 05 04 77, we will help you finding you way! Please let us also know if you arrive after 24:00h, then we will stay awake waiting for you. we fixed the date of our tournament in Munich, the first „Bier & Brezen Pokal” will be on the 3rd of july! If your team is interested to come, please register as soon as possible, since we can only accept a limited number of teams! As we announced before, you can stay with your team in a sports hall (for free! ), so that you only have to bring sleeping bags with you. This sports hall is certainly available Saturday night, probably Friday night too, since most teams arrive Friday evening. (We are waiting for a confirmation...). If you like, we will prepare a simple breakfast (coffee/tea, bread and nutella) for Saturday and Sunday morning. Please let us know, if your team wants to stay in the sports hall, and with how many people you will come! On http://uwsport.de you find a road map to the swimming pool. (Later, a map to the sleeping place will also be published there, but it is very close to the pool.) If your team likes it more comfortable, you can find a list of hostels on this homepage. 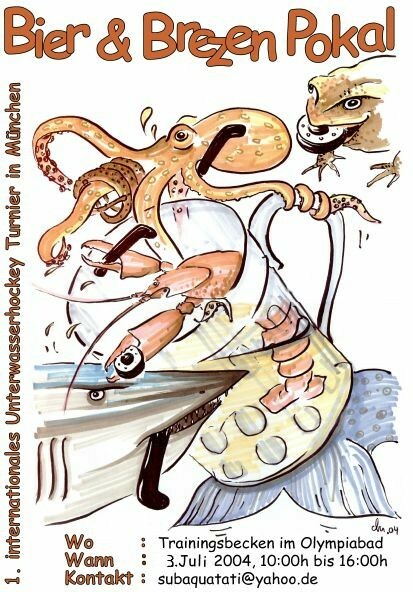 the Munich University Team invites your team to participate on the 1. international Underwaterhockey tournament in Germany, the "Bier & Brezen Pokal". It was planned to take place on the 19th of june, but since there is a tournament in Marseille at the same date, some teams asked us to delay it. A possible new date is the 3rd of july. Since we have to decide the date till the end of next week, please send us as soon as possible a note wether your team is interested to join us and wether you prefere the 19th june or the 3rd july. We will send an e-mail with the defenit date by the end of next week. All Teams can contact Tatjana Wilk by the Email address given on the image!